After watching Pride & Prejudice (2005) I've fallen in love with all things Jane Austen and Regency, and have decided to make a Regency dress! 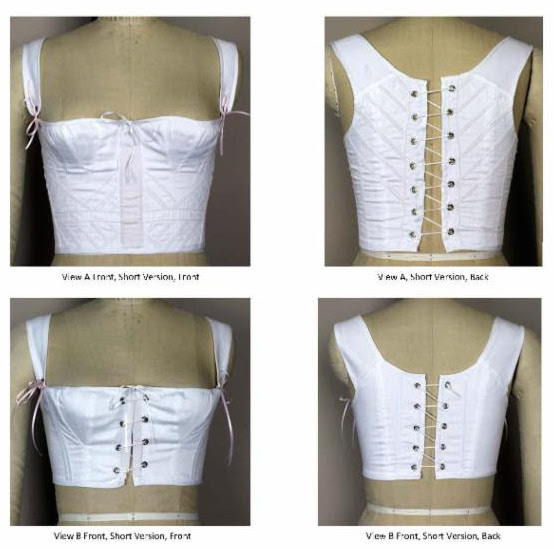 The first step in creating a historical garment always starts with the underpinnings. This post is going to be all about what a lady wore underneath a dress. Like pretty much all era's for the last several hundred years, the bottom layer is a chemise. Pretty simple, basically a long shift with a drawstring neckline made usually of cotton or linen. Next is the corset, or stays. There were two different styles popular at the time, full and half stays. The silhouette of the era had an empire waistline and a high bust. 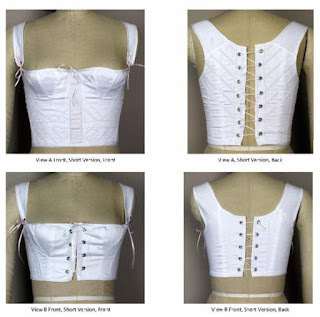 Since the waistline wasn't seen due to the style of dresses the corsets of the era weren't shaped as much around the waist as they were later in the century. Half stays don't reduce much in the waist (actually none at all since they cut off just a few inches under the bust). Instead the main purpose of them was to shift the bust up. The next layer would be a petticoat. 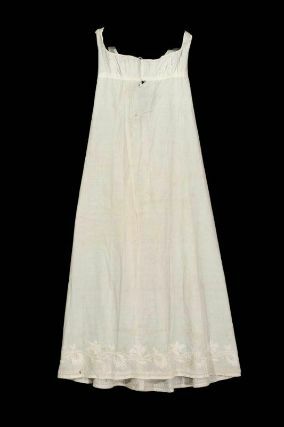 Petticoats in this era were worn more for modesty than to add volume to the skirts. 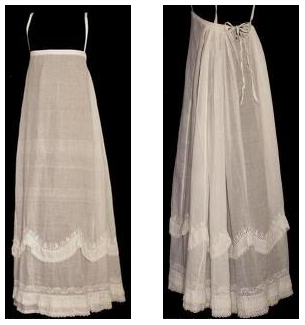 Because of the narrow cut of the skirt, when walking the skirts would sometimes cling to the legs, showing more than what was generally acceptable at the time. There were two main types of petticoats - bodiced petticoats and regular petticoats (which I don't know the exact name of this style, if there even is one). 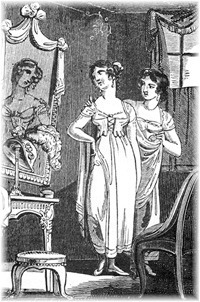 The important thing with petticoat's from this era was that the waistline matched that of the dress. So when making a petticoat it's common to use the same skirt pattern that you use for your dress. Here's a bodiced petticoat, which has a bodice, hence the name. This style usually had darts or gathers to fit the bust. And here's an example of a regular petticoat with ties going over the shoulders to hold the petticoat up. And that complete's our Regency foundation garments! I've already begun working on my Regency outfit and have completed my stays, which I'll be getting pictures of and posting about soon. Yayyy! One thing I love about Regency: it isn't so daunting as most other eras. So much more simple, if you can manage the stays. I'm going to Costume College!